I salute the courage of the Egyptian people. 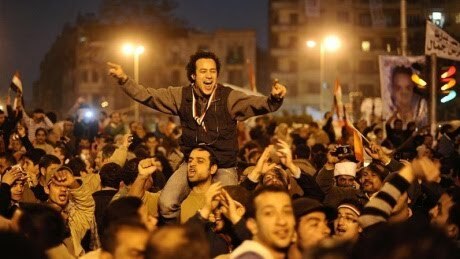 The citizens of Cairo have good reason to celebrate. After 18 days of protest refusing to yield to threats and actual violence, they have forced the country’s hated dictator Hosni Mubarak from office. So far the Egyptian army – whose leaders are a privileged class with vested interests to defend - have exhibited admirable restraint. The hope is this continues so free democratic elections can be held. This is a military coup in everything but name. The army has seen people power in action, however, and surely would be reluctant to challenge the tide of history. The desire for freedom seems to be the one unifying factor for both secular and Islamist demonstrators. So with Mubarak gone political and religious divisions are likely to quickly emerge. But so much has been achieved in such a short space of time without widespread bloodshed, there must be a good chance events can continue to proceed peacefully. I witnessed an anti-Mubarak march in London last Saturday. I was struck by how little hostility was directed at the US and the UK – despite the two countries help in propping up his 30-year-old regime. The wish is for good will from all parties. Some astute diplomacy is called for from President Obama and Mrs Clinton. Preserving the status quo in the Middle East is no longer an option. Status quo for which countries? The Middle East has become an area with many different allegiances, some even less progressive than "preserving the status quo".